With Apple set to unveil new iPhones today, we’re probably about a week away from a widescale release of iOS 7, which will mean that Apple’s seventh-generation operating system will end up dropping about a year after iOS 6. So 365 days later, how is iOS 6 doing? Really well. 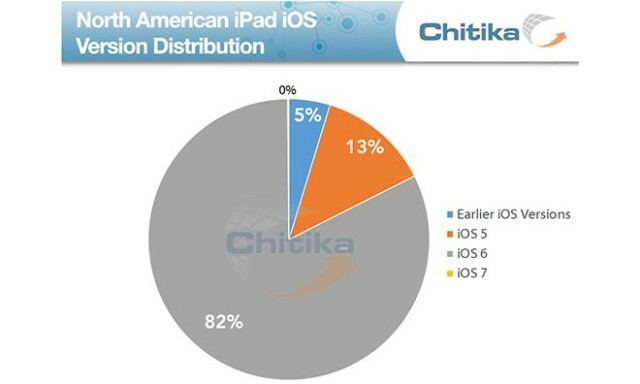 In fact, according to data released by Chitika Insights, really well: it’s installed on 92% of all iOS devices. One of the things that Apple has been really good at with its operating systems is getting people to upgrade to the latest version. While Android’s fragmentation problem is so bad that the most common version of the operating system is over two years old, and less than 6% of all users are on the most recent version. That’s a big problem. Fragmentation makes it more difficult and more expensive for developers to test apps, and makes the operating system itself less secure from attacks. No such problem on the iOS side of things, though: 92% are on iOS 6, while 5% are still on iOS 5 (my guess is that these people, like my girlfriend, are Google Maps holdouts). 1% are running iOS 7 as a beta, and 2% are running other iOS versions. These are legacy devices, likely stuck on iOS 3.1.3. If this data pattern holds, iOS 7 should see wide adoption. I wonder, though, if the aesthetic itself of iOS 7 will slightly fragment the iOS ecosystem, the way the switch from Google Maps to Apple Maps slightly fragmented iOS between iOS 5 and iOS 6. What do you think?